2018 Ty Herndon Concert for Love and Acceptance Presale! 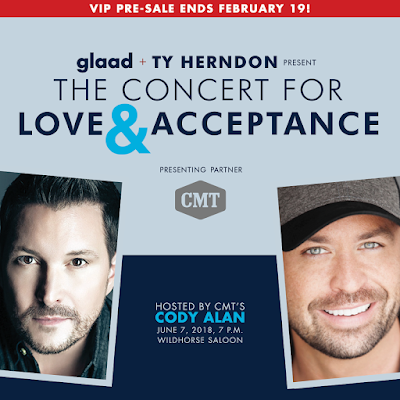 Ty Herndon has announced that the Annual Concert for Love and Acceptance will be hosted by CMT's Cody Allan on Thursday, June 7, 2018 at 7 PM. This annual event is sponsored by GLAAD (Gay & Lesbian Alliance Against Defamation) and will take place at the Wildhorse Saloon. This show has featured many great artists in the past including Crystal Gayle, Julie Roberts, Billy Gilman, Chris Carmack, Levi Hummon, Deborah Allen, Anita Cochrane, Jamie O'Neal, Andy Griggs, Jason Michael Carroll, Michael Ray, Thompson Square, Mickey Guyton, Ryan Kinder, Runaway June and more! The Concert for Love and Acceptance will bring together a coalition of artists and celebrities appearing and performing in support of at-risk youth in the Nashville community. A red carpet event will precede the concert. Tickets: $30-$125 Available Here (Presale is live code ="EPIC"), Regular Sale Tuesday, 2/20 at 7:30 AM CST. $500 tables of 4 include reserved tables in the first 4 rows. $100 tickets include rows 5-9, main floor elevated areas and 2nd floor rail. $50 tickets are general admission standing room only on the main floor, limited seating on floors 2 and 3, first come first served. Special needs seating available upon request.